Final Call News and Analysis with Sis. 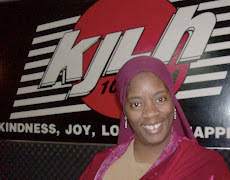 Charlene Muhammad: In with the new . . . 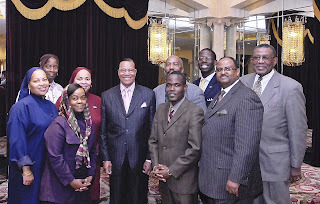 The Honorable Minister Louis Farrakhan (center) photographed in 2008 with the Final Call Newspaper's editors and staff writers. (l-r Nisa Islam Muhammad, Nubian Muhammad (front) Charlene Muhammad (back) Marcella Muhammad, Ashahed Muhammad, Abdul Arif Muhammad and Askia Muhammad (front) Saeed Shabazz and Jesse Muhammad (back).
. . . Out with the old! Today really gives new meaning to this phrase. I did a lot last year, both professionally and personally. Still, there's so much that I pledged to accomplish in 2008; wanted to accomplish; was obligated to accomplish. And in truth, I simply didn't, for many various good and bad reasons that I won't mention here. As I reflected yesterday and this morning on what I could have done differently and how to improve, the crystal clear answer was to have spent less time beating myself up about unfinished business and instead replace that time with positive action. 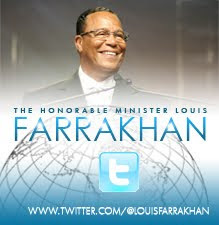 The other answer was for me to return to my foundation and the very relevant, timely and phenomenal course, "Self-Improvement: The Basis for Community Development," which the Honorable Minister Louis Farrakhan launched from Phoenix Arizona more than two decades ago. 11 overcome controversy, just try it. Change isn't easy, but there is a man (I'm not referring President-Elect Barack Obama, although he made it look that way during the elections), that's walking directly in divine order, and is an everyday example of how to get rid of excuses and get the job done. 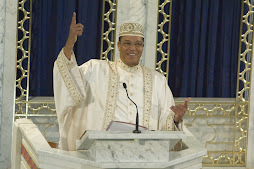 Minister Farrakhan has not failed one iota in accomplishing the mission of his teacher, The Most Honorable Elijah Muhammad, and he is still working everyday toward ultimate success. He's an example and a guide that deserves to be followed and helped better. I've a lot of goals for Mind, Matter, Movement and one of them is to make my word bond and fully transfer the information that I gathered at the Democratic Convention in Denver, as well as my routine coverage for the Final Call. In the upcoming days and weeks, look for more of My Election '08 Moments and My Final Call Journal.